Amanda Forester is a new-to-me author. The opening scenes to If the Earl Only Knew hooked me from the start. Katherine is a strong, cold, reserved woman who knows how to survive anything. With glimpses of the woman she was meant to be, it was easier to read and understand Kate. But it was not without difficulty as a decisive woman became wishy-washy later in the storyline. I won't bore you with a retelling of what is included in the synopsis. At age 12, the Ashton twins lost their father and their lives were turned upside down. Many years later, it's still affecting them greatly, especially their happiness. I enjoyed how Katherine and John played well off one another, bringing a much needed light and humorous element to an otherwise dark story. The push-pull, will-they-won't-they banter was the highlight of the book. The romance does take a backseat to the adventuring portion of the storyline, and the between-the-sheets action is fade-to-black. The main issue that detracted from my overall enjoyment was pacing. Not only the pacing of the story – where I found it tedious at times, where I generally read a book quickly, this took me upwards of 12 straight hours to read the same amount of pages where another book would take six hours – but the pacing with the release of important information. In a storyline filled with secrets and intrigue, it's hard for me as a reader to understand why the narrator blocked me out of what was going on. I'm inside their mind, and they are thinking 'around' it, but giving no detail. There was no need to withhold information until 75% or longer, when it took me the better part of a day to get a snippet of what was actually going on. There is mystery as a storyline – the mystery in which the narrators haven't solved because they have no knowledge – then there's withholding by the author via the narrators – which isn't a mystery at all, but an annoyance. The reader isn't to understand until it becomes dialogue instead of monologue. I also felt, as people who have been through so much struggle, had been on their own since they were twelve years old, fought in naval battles and were pirates, how they stuck their head in the sand, refusing to gather the information the reader was lacking as a way to draw the story out longer. The resolution just dropped into their laps through no help of their own. Instead of paced out accordingly as it happened or through narration, it became info-dumping as a resolution. The ship broken into, their accommodations ransacked and landlady assaulted, the home of their friends broken into on Christmas, then kidnapped (multiple times), wounded, with people lurking around, the church, Sir Anthony's. I find it hard to believe that Kate and Robert never once thought, "I wonder why this is happening?" They just went to balls and weddings? ... ... People being harassed and harmed – murdered – people with commendations during acts of war do not wring their hands and go about their daily lives. If my house was broken into on Christmas, and I was harboring my friends for safety reasons, and I had means and know-how and a vulnerable family to protect, I'd be investigating the how and why of it. At least call in the authorities. No one seemed to care how the house was broken into in the first place, with an illusion of safety minutes afterward. "So glad the bad guys ran off." Not once, with a myriad of crimes, was anyone called into investigate the crimes, when they were Earls, Ladies, Lords, and a Sir. The foundation of the story felt convoluted to me, and I realize this is fantasy, adventuring, historical romance, not reality. But with a swifter pacing, I could have overlooked the fact that these character, who had been survivors as children, now seemed to have absolutely no self-preservation and had lost their ability to protect themselves or ask for protection, when they were pirates and battle heroes...after their past, they would have protected what was theirs, no doubt with many in their employ, yet they acted destitute and homeless and never asked for help from the authorities. My apologies for spiraling down the nitpick rabbit hole. I just finished the story, so it's fresh in my mind. I ought to have waited to review instead. The story was just not my cup of tea. Recommended to fans of historical romance, where the romance takes a backseat to the conflict and fade-to-black. Will I read more by this author? Yes. Some books just don't resonate with a reader – this particular storyline wasn't to my tastes, but perhaps another by this author will be. Amanda Forester holds a PhD in psychology and worked many years in academia before discovering that writing historical romance was way more fun. Whether in the rugged Highlands of medieval Scotland or the decadent ballrooms of Regency England, her novels offer fast- paced adventures filled with wit, intrigue, and romance. 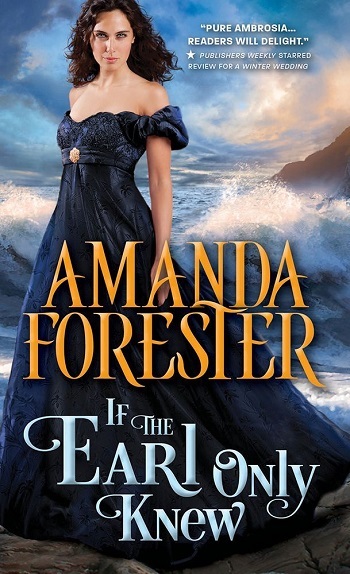 Reviewers on the Wicked Reads Review Team were provided a free copy of If the Earl Only Knew (Daring Marriages #1) by Amanda Forester to read and review.